On September 18 and 19, Fairfax Community Church in Fairfax, Virginia, will host the fourth Church of God Regional Convention of the year. Though they look forward to this opportunity to welcome a cross-section of the Movement to their campus, their day-to-day ministry will not come to a halt. At any given moment, life-giving ministry is made possible somewhere in the world because of this congregation. Their work with refugees at home and abroad, the twenty churches they’ve planted or restarted across the globe, and their bold neighborhood-by-neighborhood reclamation in and around the nation’s capital, are only three of numerous areas of incredible impact. Convention-goers will be inspired to see and hear more of Fairfax’s story in person with their stellar staff, but a recent interview with Pastor Rod Stafford offers the entire Movement a glimpse of just how they give life to their city, state, country, and world. 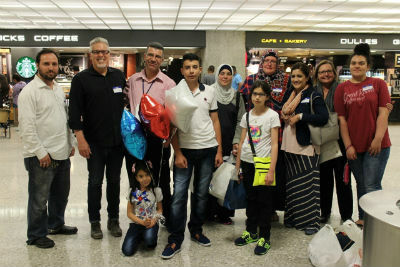 Two years ago, CHOGnews chronicled the story of the refugee family that was adopted by Fairfax Community Church during the Syrian refugee crisis. Today the church continues to love, serve, and bless that family. Whether the area of need concerns housing, employment, or general navigation of Western culture in America, Fairfax Community Church is there. Through that relationship, the church has crossed paths with other refugee families in the area; though the church can’t formally adopt every family they come across, they have been able to direct them to resources readily available to them. Additionally, the church’s partnership with Heart for Lebanon continues to address the refugee crisis—and other great needs in the region—with holistic, transformational ministry. Pastor Rod Stafford (second from left) and the refugee family adopted by the church. Also in the past year, Church of God Ministries celebrated the first anniversary of the AtHome church plant in Paris, France. Not surprisingly, Fairfax Community Church was one of the stateside churches deeply involved in the process. In fact, Pastor Rod Stafford serves on the board for the Paris congregation. 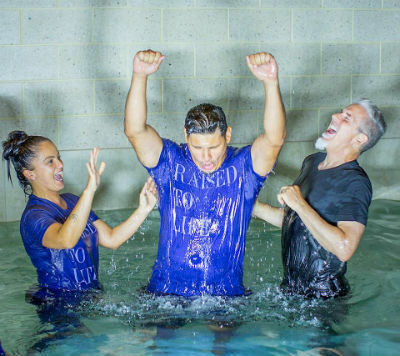 AtHome, as only one of twenty churches Fairfax has helped start or restart, is equally thrilling for Pastor Rod and the congregation to support. They understand the concept of church multiplication, as they’ve encouraged and equipped disciples to be disciple-makers. They’re giving life in Jesus’ name, and that gift goes on and on. Now they celebrate fifteen “granddaughter” churches—that is fifteen churches planted by the original twenty! 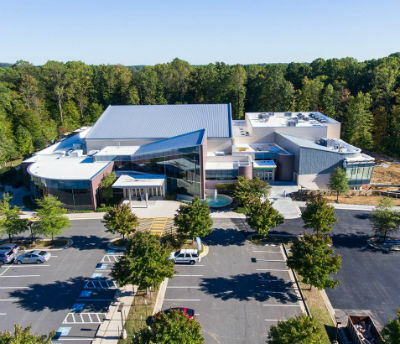 Bird’s-eye view of Fairfax Community Church. As a follow-up to a 2014 CHOGnews article about the Clarksburg, Maryland, congregation uniting with Fairfax Community Church, all glory is the Lord’s. A new young pastor, Beth Wolfe, is leading a growing, young congregation there, and they are also making a great impact on their city, only forty-five minutes from Fairfax Community Church. Pastor Rod says it’s been an experience they hope to replicate. He also adds that they’re recognizing the value of moving from a campus relationship with Clarksburg to more of an individual, local congregation experience. And that’s just part of their story. See it for yourself this September 19–20! Register by August 16 for the early-bird rate at www.chogconvention.org. This entry was posted in All Church of God, Church of God Convention and tagged 2018, CHOG Convention, Clarksburg, culture, D.C., District of Columbia, Fairfax, Fairfax Community Church, global, international, LifeFairfax, Maryland, MD, missional, missions, refugee, refugee crisis, regional convention, regionals, Rod Stafford, VA, Virginia, Washington. Bookmark the permalink.